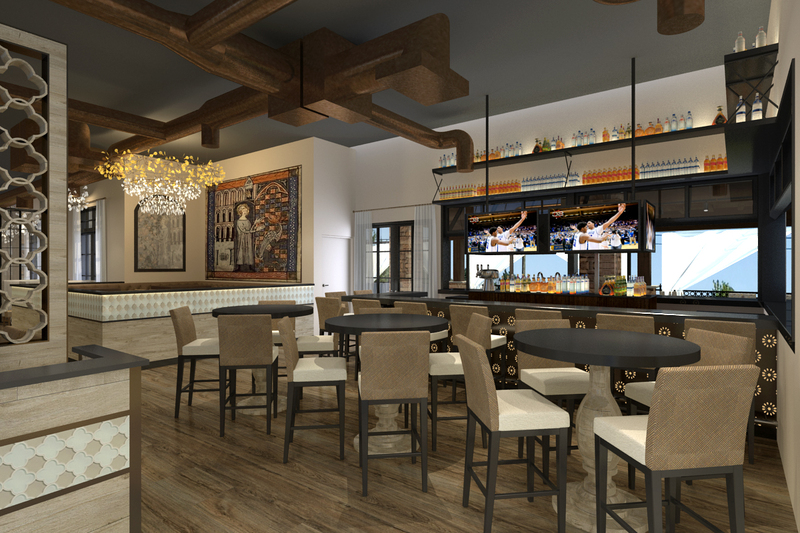 A rendering of St. Amand Kitchen & Cocktails from the couch area looking towards the bar. PHOENIX, ARIZ. (July 31, 2018) – An iconic restaurant and wine bistro located in the Ocotillo community in Chandler, Arizona, is undergoing a refresh and rebrand led by a trio of Valley professionals who are bringing their vision to the project. D-Vine Bistro & Wine Bar, 12 years ago one of the first restaurant-wine bistro “hot spots” at 3990 S. Alma School Rd., will be transformed into St. Amand Kitchen & Cocktails with a scheduled opening date of October. St. Amand is the patron saint of winemaking, beer brewing, and bartending. The project team comprises restaurateur and owner Robert E. Coulson; Ken Morrow, One Way General Contractors; and Beth Katz, KatzDesignGroup. A rendering of the exterior of St. Amand Kitchen & Cocktails looking into the space. 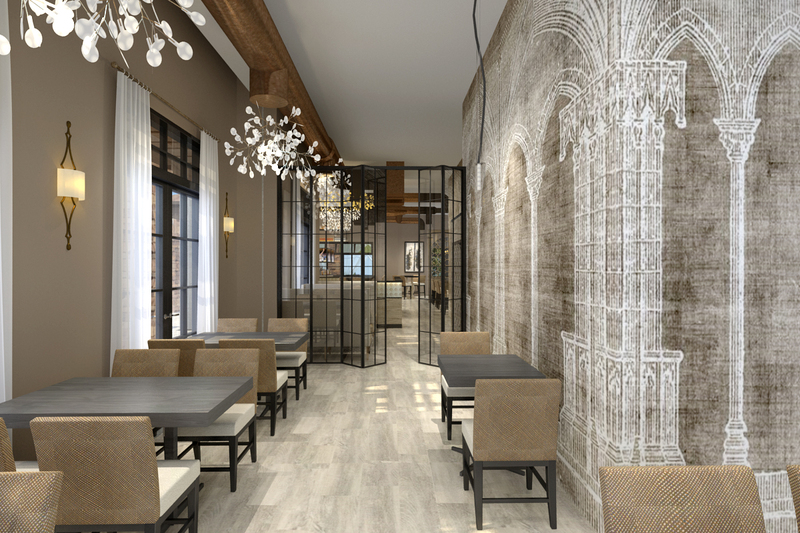 The restaurant interior will have a clean, modern cathedral style vibe, Katz said of the 4,100-SF remodel project. 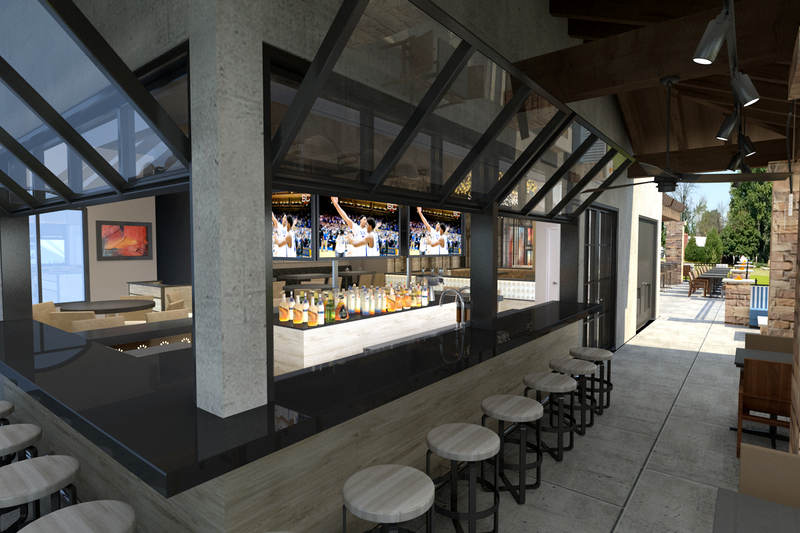 The KatzDesignGroup team is opening up the space to allow for a relocated larger bar, allowing more light into the space, providing a closed off private dining space for parties, and extending the patio with more shaded area. Said Coulson, who bought the restaurant in 2010: “The community is very much aware, excited, and anticipating the new look. The transformation from D-Vine to the new and exciting St. Amand has created a buzz. “We intend to keep the atmosphere of casual chic with a neighborhood feel. Good people and good food have been our hallmark. Our neighborhood is our home,” Coulson said. Ramon Rice, who has been executive chef for both D-Vine Bistros in Chandler and Mesa, is driving the new menu for St. Amand. A rendering of the bar at St. Amand Kitchen & Cocktails in Chandler. 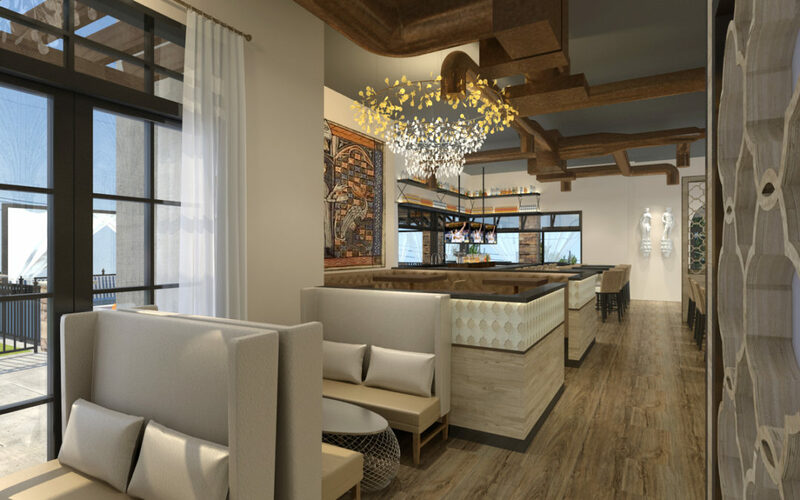 A rendering of the seating area at the rebranded St. Amand Kitchen & Cocktails.